Our entryway hallway has pretty much stayed the same since we moved in and I’m itching for a change! 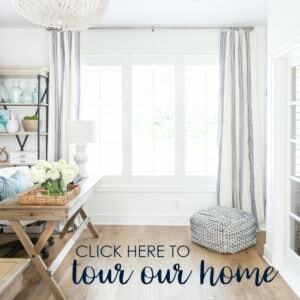 Over the past few months, I’ve been looking at various console tables, and today I thought I would share some of my favorite coastal modern console tables with you. I’ve tried to include a variety of price points and styles, but also stuck with ones that work well with the modern coastal style that I love so much! Here is how the space currently looks as of a few weeks ago. I got our entryway console table shortly after we moved in and have loved it for the past five years. But, it’s basically a fur magnet (the cats rub all over the metal frame) and I’m ready for something a bit more substantial. This area is one of my favorite features of our home, but I feel like it needs a bit of tweaking to make it as amazing as I have it in my head 😉 Sometimes the space feels a bit choppy and disconnected from other areas in our home. I’m also contemplating adding trim work around the doorways to make it look more like an architectural feature. Following are a few looks (and a console table) I’ve loved for some time. I love the mirror (I prefer round)/lamp/basket/table/accessories combo and have really been wanting to go that direction lately. 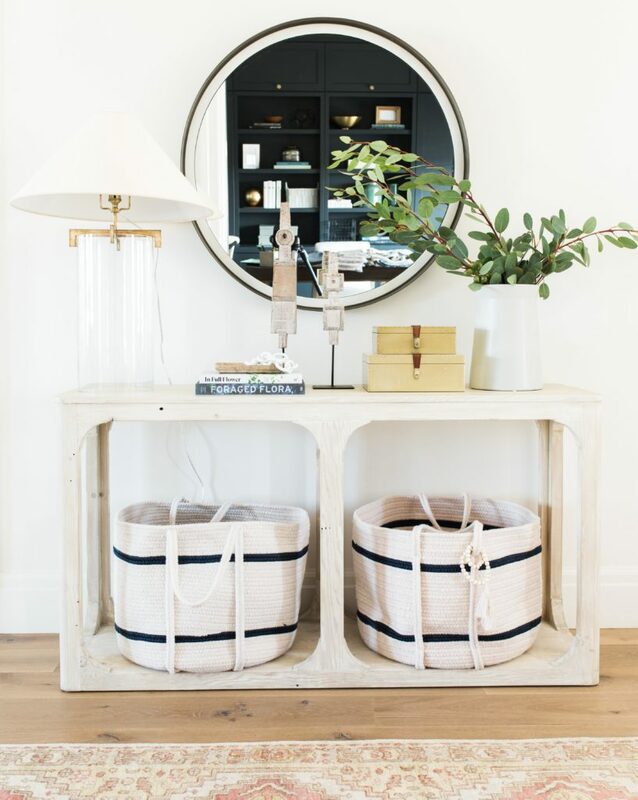 But our current console table doesn’t allow for the baskets below. Interestingly enough, I found that Restoration Hardware also carries this table (under a different name and a higher price). 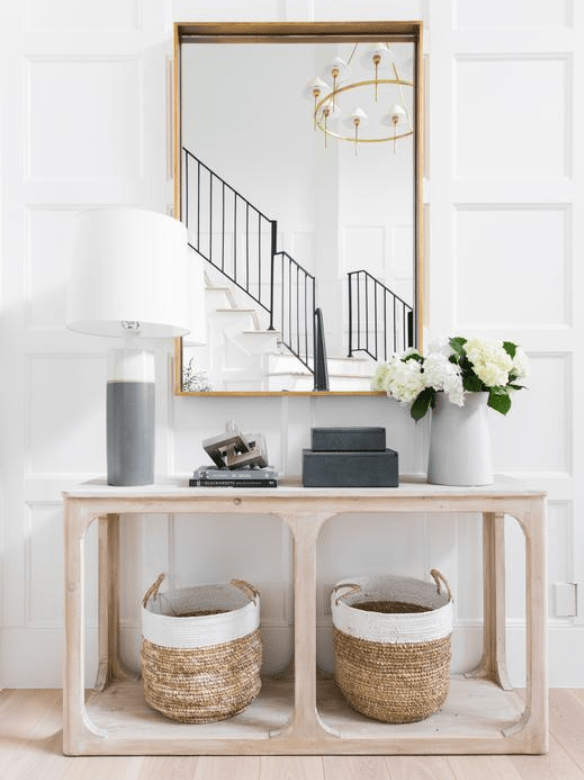 Console Table and Entryway via McGee & Co.
As much as I love that console table, I’m trying to consider a few other options because of the price. 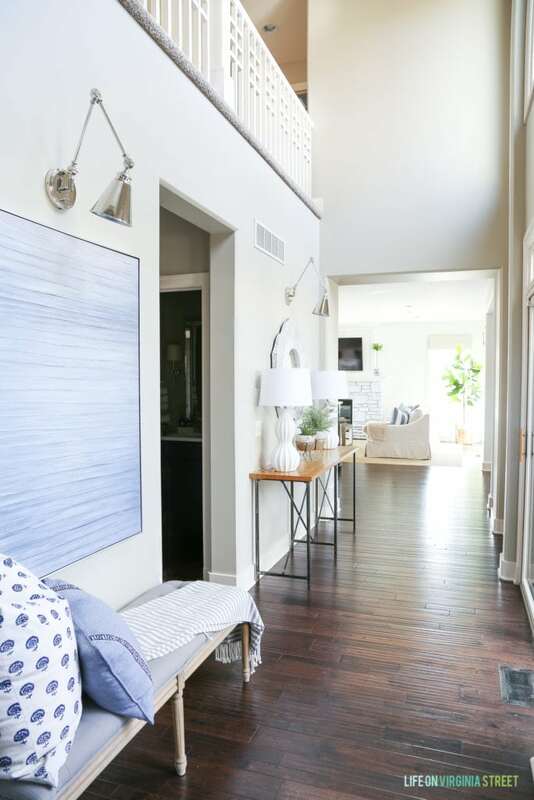 I love how that particular style has the solid bottom would break up the sea of really dark hardwood floors down our hallway (and would allow for the baskets). But I need to keep length and depth in mind. I also want something with a bit of an airy feel (not a solid cabinet) so it doesn’t feel cramped in the entryway. 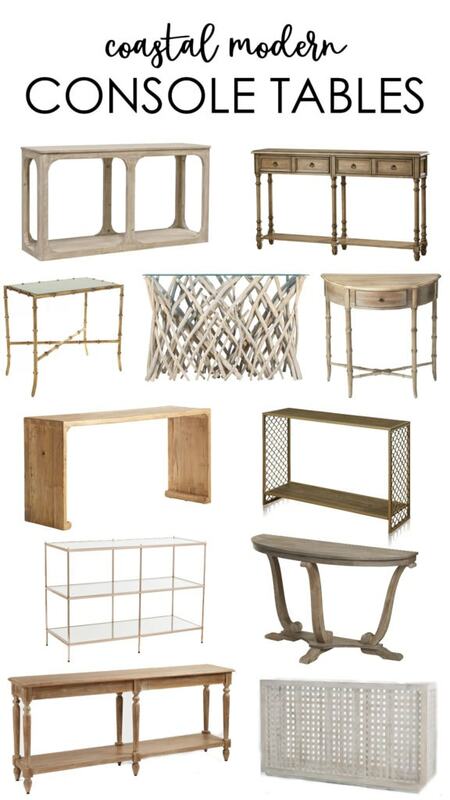 Following are some of my top console table picks at various price points. 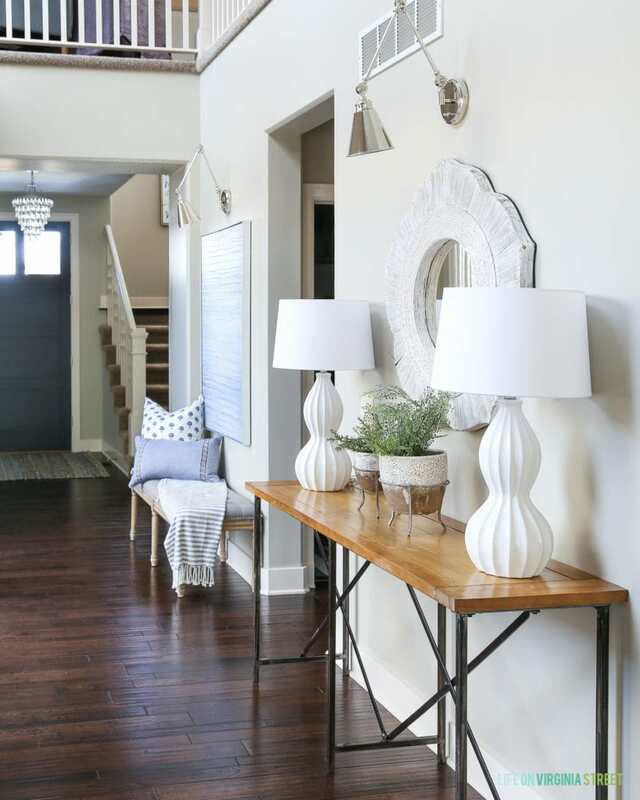 They would all look great whether in an entryway, a living room, or other space in your home. Simply click any of the images below to learn more about each of the items shown. You may have to double-tap on mobile. I’m really loving this streamlined option for just inside a front door or other small area! It comes in four finishes but I love the driftwood version! I’m really trying to take my time on this decision, since it isn’t a “must” update. However, I’d really like to get something finalized by summer when we have a lot of visitors staying with us. Which coastal modern console table option is your favorite? I’d love to hear! Love the evert table from world market. I just bought the set from RH and am absolutely obsessed. I got the darker finish but I saw the lighter one in store and it’s also gorgeous. A little less washed out that the Mcgee one. You wont be disappointed. 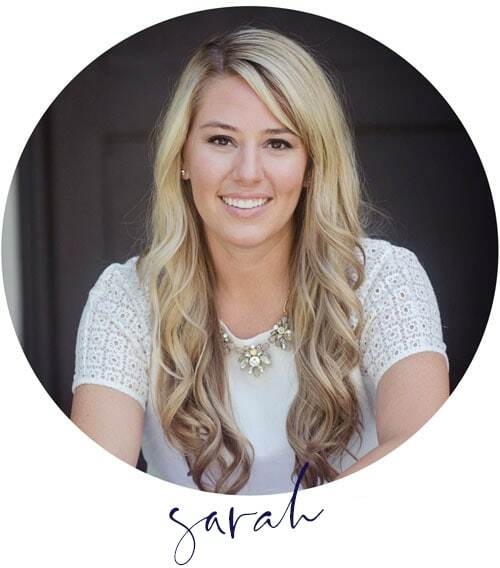 Are you in the RH member program? That made it a better deal. That’s great to hear! I can’t decide if it’s worth paying the $100/year to get the price break or just order when there is a sale at other stores. I’m so glad to hear you love them though! I like the open storage underneath, lots of options to style this baby! I just found this one that is similar to the table from Studio McGee. Still love the other more. Check it out. You seriously just found GOLD!! I’m so happy you shared this with me. I don’t love the slatted bottom as much but since my plan is to add baskets there, it may not even be an issue. Thank you SO much for sharing! This is a new leading contender!! YES!! I would love to hear how this one turns out. Keep me posted! !